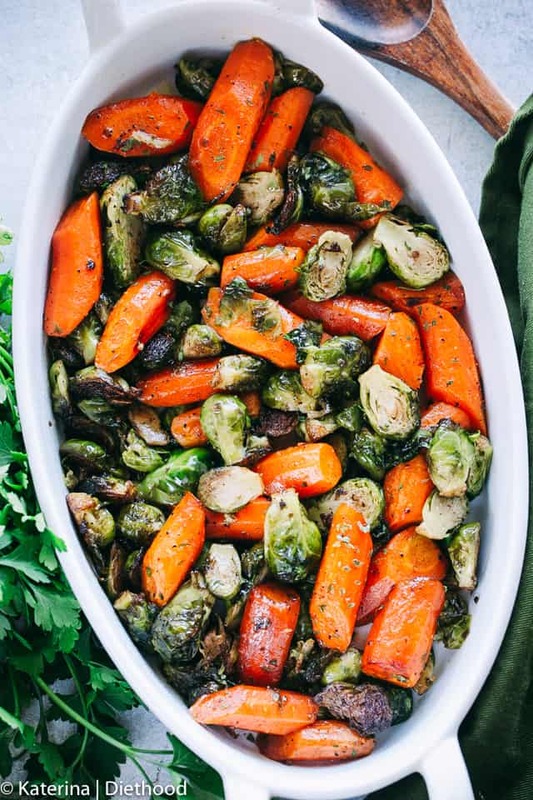 Garlic Brown Butter Roasted Brussels Sprouts and Carrots – Incredible Holiday side dish with brussels sprouts and carrots tossed in garlic brown butter and roasted to a delicious perfection! Aaaaand here we go! All the Holiday side-dish recipes, all the time! 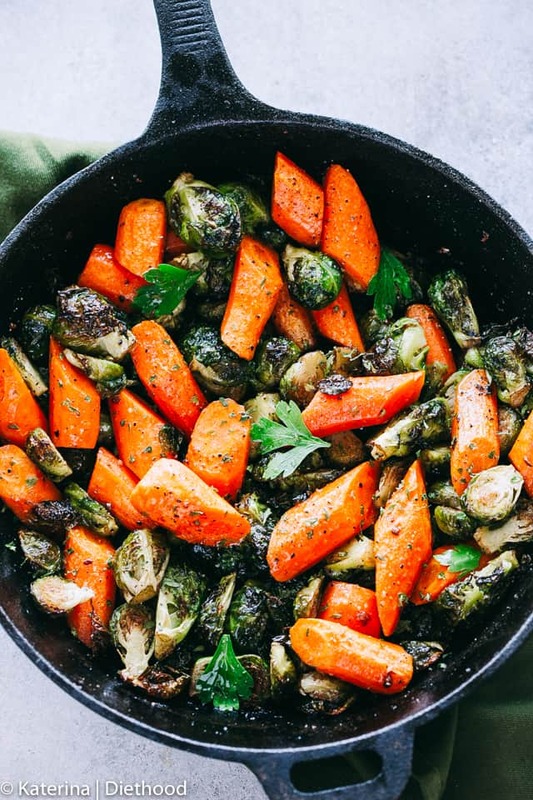 Starting with these roasted brussels sprouts and carrots tossed in GARLIC BROWN BUTTER. Hey pals! How about that extra hour of sleep yesterday?! Did you use it or nah? I sure didn’t. Was up at the crack of dawn scrolling down my Facebook feed and clicking “like” on all the cat videos. That’s what Sundays were made for. Also? Can we finally just get rid of the time-changing deal? Who wants the moon at 4:30 pm?!? NO.BODY. 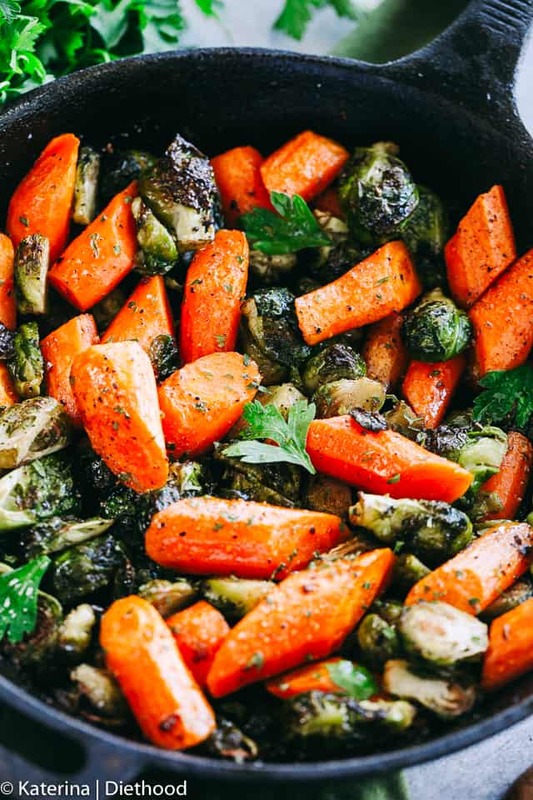 And who wants these Garlic Brown Butter Roasted Brussels Sprouts and Carrots for din din? EVERY.BODY. Which is pretty much the only thing I want to eat between now and March. This one time… I wanted to faceplant into my Garlic Butter Roasted Carrots. Honestly. I think I make those carrots thrice a month, at the least. But since I have a very deep love for brussels sprouts, too… and garlic and butter… I decided to marry those 4-ish things together in a pan and enjoy it all in one single bite. This recipe is basic and super simple, and it involves browning some butter, tossing a bunch of garlic in it, and then bathing your veggies with it. About 30 to 35 minutes later, you’ll be able to serve it to yourself and realize just how much you love your vegetables. They are a tad sweet, a bit savory, of course buttery, garlicky, and crisp-tender. It’s the perfect veg side dish, you’ll see. Important step to remember is to cut up the carrots smaller so that they will cook evenly and at the same time as the brussels sprouts. My sprouts were muuuuch smaller than usual, which is why the carrots look huge, but trust me, they were cut in about 1-inch chunks. But seriously, you guys, once they are done, they are just so so so good. Now, please take a fork to them and eat ’em up! Want some honey with those carrots? Well… then… make my Honey Garlic Butter Roasted Carrots. 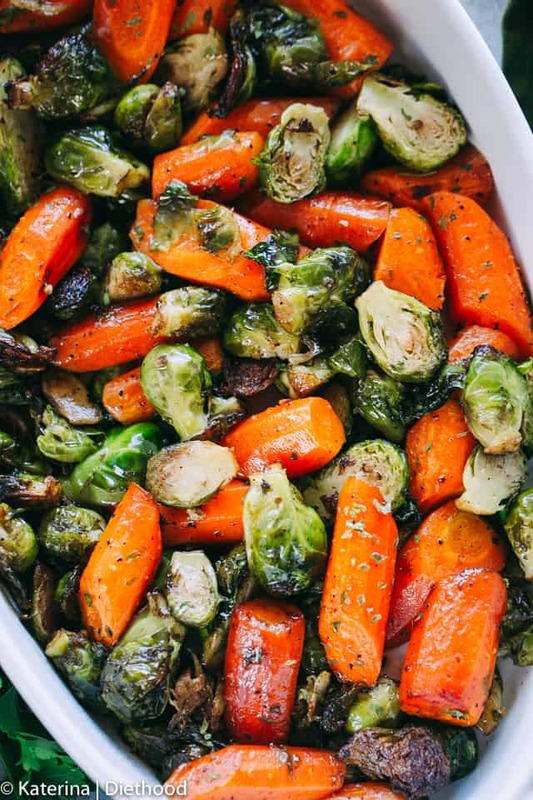 Your guests will love this incredible holiday side dish with brussels sprouts and carrots! Tossed in garlic brown butter and roasted to a delicious perfection. 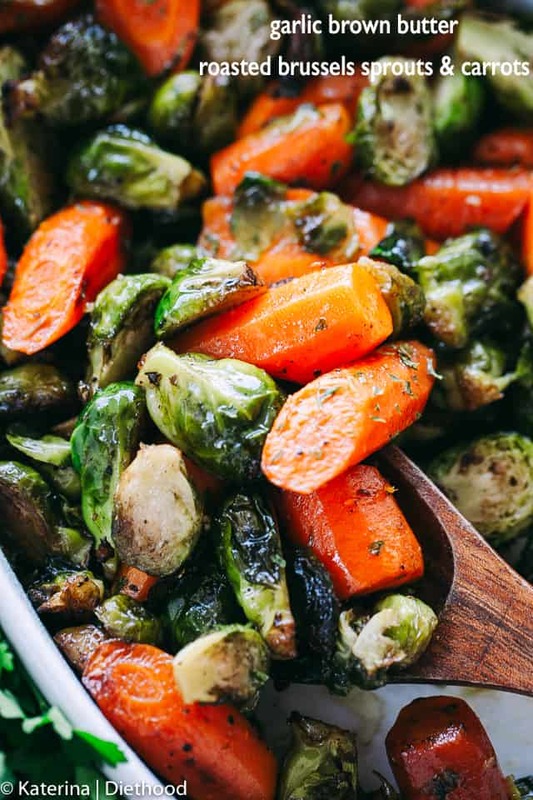 Spread carrots and brussels sprouts on a baking sheet in one single layer; set aside. Add butter and garlic in a large, heavy bottomed nonstick skillet and melt butter over medium heat. Swirl the pan occasionally to be sure the butter is cooking evenly. Cook for 6 to 8 minutes or until butter is lightly browned, stirring frequently and skimming foam as necessary. DO NOT burn the garlic! Remove browned butter from heat and pour over prepared vegetables; season with salt and pepper and stir until thoroughly combined. Roast for 30 to 35 minutes, or until veggies are tender. I’m wondering if you put the browned butter on before you cook the veggies, does it have a tendency to burn? I’m wondering the because the butter will be cooked well first then in the oven for at least a half hour(I usually roast my veggies a bit longer). 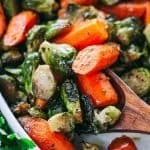 I would like to know if it is possible to use frozen brussel sprouts in this recipe. Do you think it would be necessaary to defrost them first? I would say to first defrost only because of the water that they will release… it will water-down the flavors. This looks really flavorful! Perfect to try this weekend! This is the perfect winter side dish! I love those veggies! Roasted veggies are the best! It’s the perfect side to any dinner! Looks so delicious and healthy! I have to put this on my menu! This looks like the next side dish I’m going to be trying at our house! Garlic brown butter?! Yes please! These veggies looks delicious! Definitely have to make them! Looking at your pictures is making my stomach growl!! Yum!! I made this and added inn butter nut squash cubes and celery. Went Well with my Thanksgiving Ham. There is also an option to do a balsamic glaze instead.